I remember the year I started to understand how innately artificial school was compared to real life experience. All through school I was a bright student. I loved learning, and at times I even loved school. But school confused me. When I was at the peak of curiosity about a topic, engaged and attentive, it was time to switch activities. Or I was called a teacher’s pet. Sometimes the teacher would reprimand me for being too enthusiastic, for doing the work too quickly, or for helping others. Nothing would crush my spirits, however, as much as eighth grade did. In eighth grade we had to take one “extra” class for a quarter. So we took home economics, foreign language, shop, and agriculture all in one year, to supposedly give us a taste of high school I guess. Spanish class was easy, as was home ec. Shop scared the dickens out of me, but I had managed to get myself in the same class as most of the handy boys. Ag class was a different monster. It was the first class I almost failed. In fact, I think it was only one of two classes that I got below a B in. It shouldn’t have been that way. Ag class should have been a breeze for me. I had always lived and/or worked on a farm. Our farm went back five generations to when my ancestors moved here from Germany. It was in my blood. It was my daily experience. I knew I was in trouble the first day. We got a flimsy textbook/workbook filled with boring information and diagrams in black and white. Our first topic of study was judging chickens. My brain was turned off for the rest of the quarter. I remember studying about chickens, but never getting to see or touch a live one. I think we studied pigs too. Or rather, we read about them. There was a huge disconnect from that class and what I lived every day. I don’t know what the point of it was – whether to prepare us for a career, entice us into joining FFA, or broaden our interests. Whatever the reason, none of them happened. At least not with me. It was worthless to me. It didn’t help me with any of the knowledge I needed for our farm. We raised beef cattle and crops. The information presented was so dry and boring that I never wanted to hear about chickens or pigs for a long time after that. I think the teacher was frustrated with me. He was a nice man. He even came out to visit my dad on our farm once. I was just getting back from checking fences and moving bales of hay. I guess it didn’t dawn on him that I was getting pretty good grades in the real life class of agriculture. 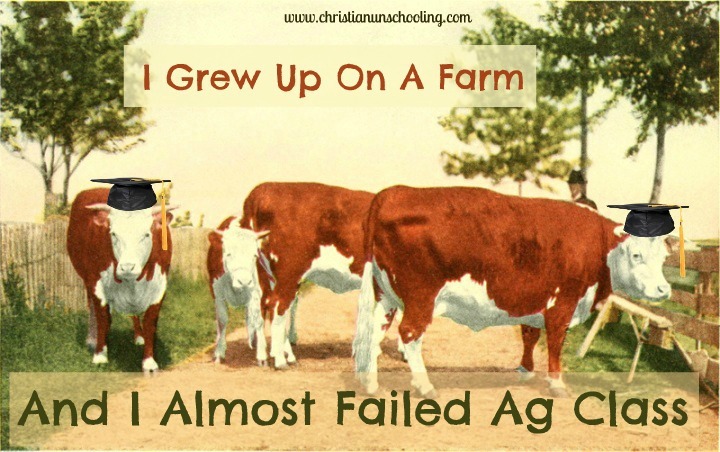 After getting a low grade in ag class, I started to realize that school was not reality. History class was simply reading from a text – it wasn’t all there was to history and it could never allow you to truly experience history being made. Studying diagrams of cells and organs was nothing compared to experiencing life and nature first-hand. The first time I remember seeing a baby calf being born was one of the most educational and amazing experiences of my life. No classroom could compare with that. And poor ag class. You could just never measure up to living on a farm: getting up every morning to feed bucket calves and take care of your horse before the bus came to take you away from life to the sanitary classroom.